Clean the scanner about once a month, when anything is spilled on it, or when debris or dust collect on any of the surfaces. 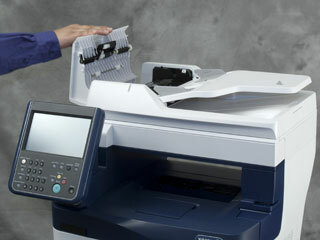 Keep the feed rollers clean to ensure the best possible copies and scans. Slightly dampen a soft, lint-free cloth with water. Remove any paper or other media from the output tray. 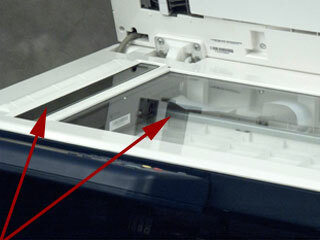 Wipe the surface of the document glass until it is clean and dry. 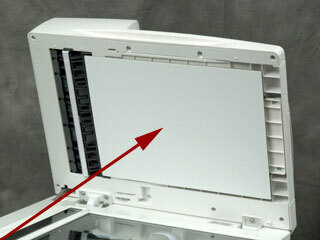 NOTE: For best results to remove marks and streaks, use Xerox glass cleaner. Wipe the white underside of the document cover until it is clean and dry. 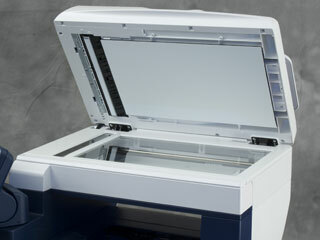 Open the duplex automatic document feeder top cover. 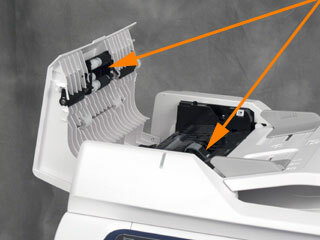 With a dry, soft lint-free cloth or paper towel, wipe the duplex automatic document feeder feed roller and the retard pad until they are clean.